Is there a better alternative to Calculator +? Is Calculator + really the best app in Mathematics category? Will Calculator + work good on macOS 10.13.4? Calculator + is an advanced, extensible calculator accepting natural (infix) formula notation. There are many built in functions and operators for common scientific and binary tasks. You can easily extend Calculator + with your own functions sets, or download predefined function sets from our website for business, science and astronomy for FREE! Calculator + always opens a standard calculator window - however, you may open as many calculator windows as you like and save them as documents. Calculator + needs a review. Be the first to review this app and get the discussion started! Calculator + also provides a history log that allows you to check and modify your input or just jump to any desired calculation from the log. 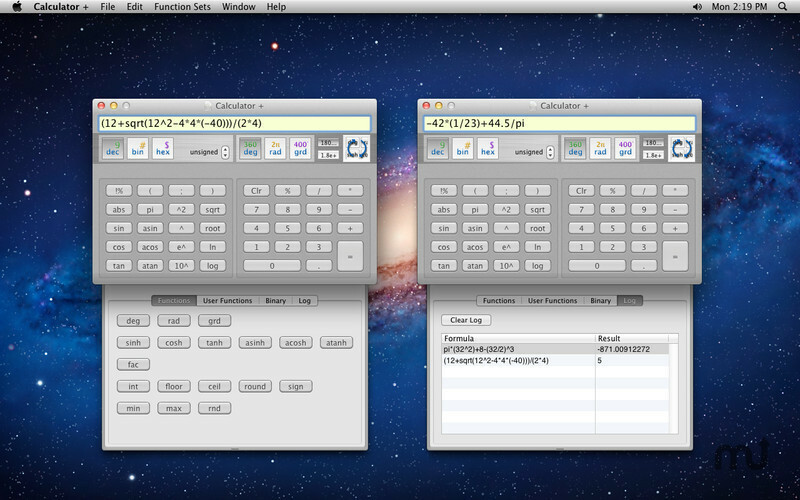 Calculator + also runs as a service, so you can just type a formula in nearly any Mac app, select it and run Calculator + from the Services Menu to compute the result.